A typical web application is usually composed of several UI components that share data. Often, multiple components are tasked with the responsibility of displaying different properties of the same object. This object represents state which can change at any time. Keeping state consistent among multiple components can be a nightmare, especially if there are multiple channels being used to update the same object. Take, for example, a site with a shopping cart. At the top we have a UI component showing the number of items in the cart. We could also have another UI component that displays the total cost of items in the cart. If a user clicks the Add to Cart button, both of these components should update immediately with the correct figures. If the user decides to remove an item from the cart, change quantity, add a protection plan, use a coupon or change shipping location, then the relevant UI components should update to display the correct information. As you can see, a simple shopping cart can quickly become difficult to keep in sync as the scope of its features grows. In this guide, I’ll introduce you to a framework known as Redux, which can help you build complex projects in a way that’s easy to scale and maintain. To make learning easier, we’ll use a simplified shopping cart project to learn how Redux works. You’ll need to be at least familiar with the React library, as you’ll later need to integrate it with Redux. You can access the entire code used in this tutorial on GitHub. In Redux, all data — i.e. state — is held in a container known as the store. There can only be one of these within an application. The store is essentially a state tree where states for all objects are kept. Any UI component can access the state of a particular object directly from the store. To change a state from a local or remote component, an action needs to be dispatched. Dispatch in this context means sending actionable information to the store. When a store receives an action, it delegates it to the relevant reducer. A reducer is simply a pure function that looks at the previous state, performs an action and returns a new state. To see all this in action, we need to start coding. using native ES6 functions to execute immutable operations. In case the documentation I’ve linked isn’t useful, don’t worry, as you’ll see how they’re used in practice. Let’s start coding! 1st statement. We import a createStore() function from the Redux package. type — a simple string constant e.g. ADD, UPDATE, DELETE etc. 3rd statement. We create a Redux store, which can only be constructed using a reducer as a parameter. The data kept in the Redux store can be accessed directly, but can only be updated via the supplied reducer. In the code above, we’ve renamed the generic reducer to cartReducer. There’s also a new empty reducer named productsReducer that I’ve created just to show you how to combine multiple reducers within a single store using the combineReducers function. Just to confirm that the store has some initial data, we use store.getState() to print out the current state in the console. You can run the dev server by executing npm start or yarn start in the console. 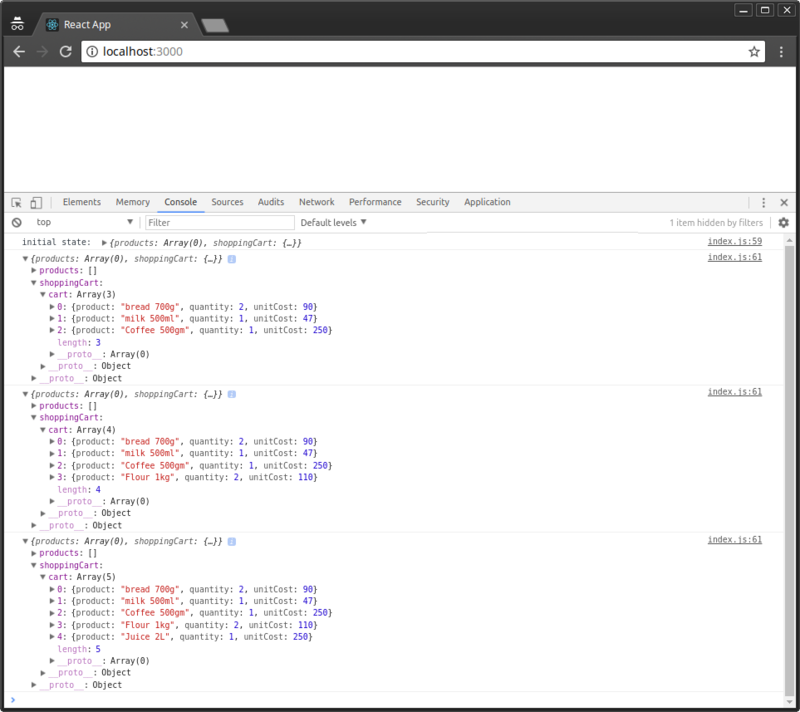 Then press Ctrl+Shift+I to open the inspector tab in Chrome in order to view the console tab. Take your time to analyze and understand the code. A reducer is expected to handle different action types, hence the need for a SWITCH statement. When an action of type ADD_TO_CART is dispatched anywhere in the application, the code defined here will handle it. As you can see, we’re using the information provided in action.payload to combine to an existing state in order to create a new state. As confirmed, the quantity for 1kg of flour is updated from 2 to 5, while the the 500gm of coffee gets deleted from cart. Now, if we’ve made a mistake in our code, how do we debug a Redux project? 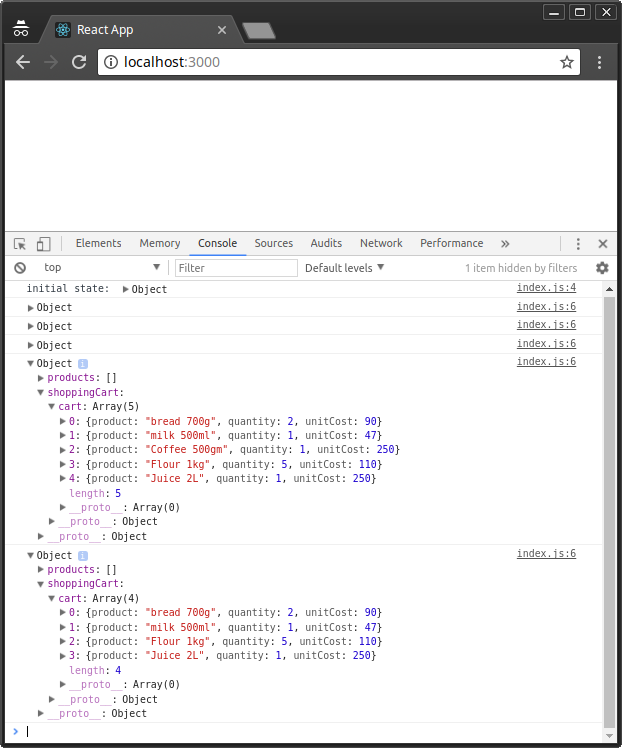 Redux comes with a lot of third-party debugging tools we can use to analyze code behavior and fix bugs. 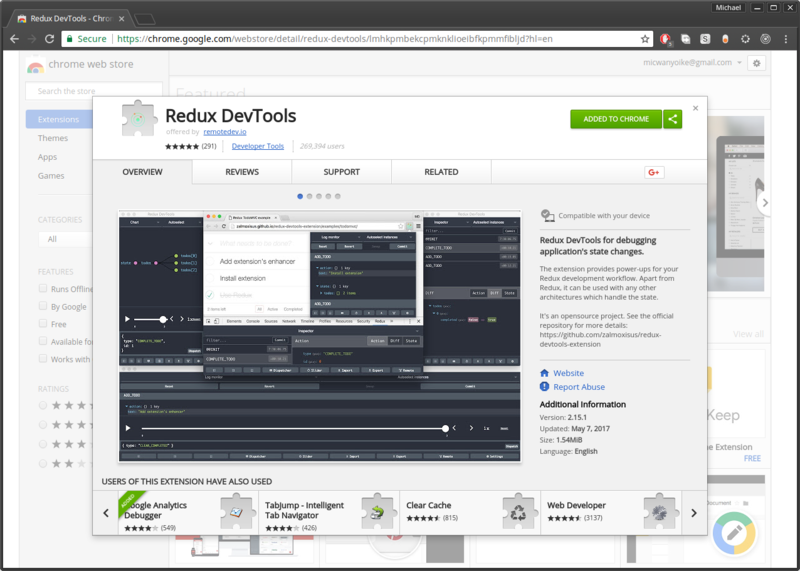 Probably the most popular one is the time-travelling tool, otherwise known as redux-devtools-extension. Setting it up is a 3-step process. 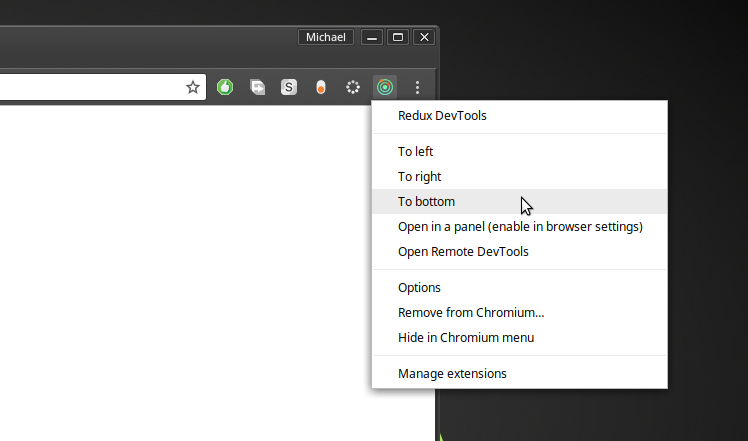 First, go to your Chrome browser and install the Redux Devtools extension. Next, go to your terminal where your Redux application is running and press Ctrl+C to stop the development server. 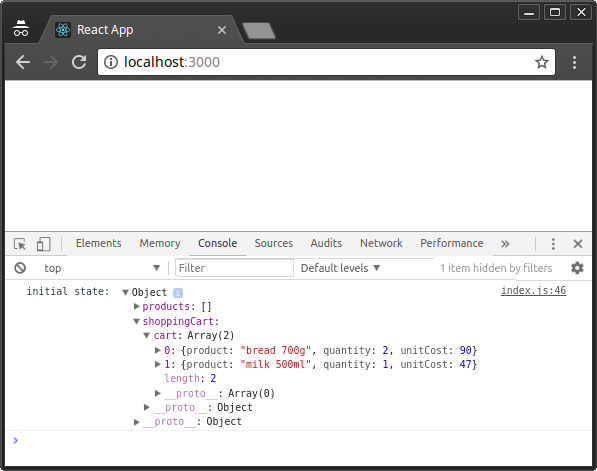 Next, use npm or yarn to install the redux-devtools-extension package. Personally, I prefer Yarn, since there’s a yarn.lock file that I’d like to keep updated. In my case, I’ve selected to To Bottom option. Feel free to try out other options. As you can see, the Redux Devtool is quite amazing. You can toggle between action, state and diff methods. Select actions on the left panel and observe how the state tree changes. You can also use the slider to play back the sequence of actions. You can even dispatch directly from the tool! Do check out the documentation to learn more on how you can further customize the tool to your needs. Just like that, we’ve completed the first part of the integration. You can now start the server to see the result. The second part involves linking React’s components with the Redux store and actions using a couple of functions provided by the react-redux package that we just installed. In addition, you’ll need to set up an API using Express or a framework like Feathers. The API will provide our application with access to a database service. In Redux, we’ll also need to install further packages such as axios to perform API requests via Redux actions. Our React components state will then be handled by Redux, making sure that all components are in sync with the database API. To learn more on how to accomplish all this, do take a look at my other tutorial, “Build a CRUD App Using React, Redux and FeathersJS”.